Now that there is more than 650,000 apps on the iTunes App Store, there are plenty of apps that get little or no traffic anymore. Two apps I developed back in 2010 were in that category. They were simple fortune telling apps that were gimmicky and fun for kids. These apps actually did make some money originally, and still do make a trickle of income, but not much. Being that both apps were gimicky, I had no real interest in doing anything more with them. So, I looked into options for selling them. I found Flippa.com and used the site to sell both. 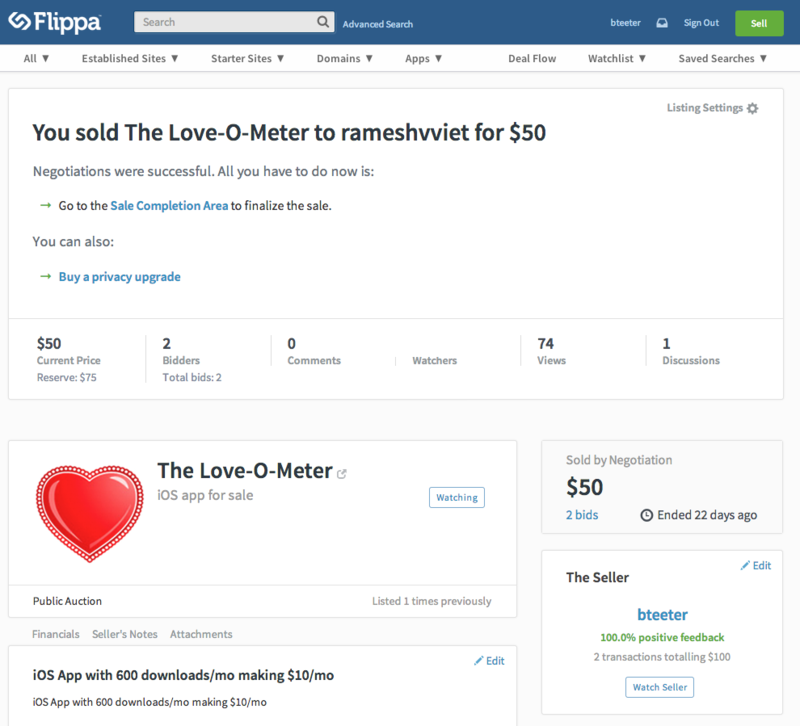 I was initially skeptical of the Flippa for a few reasons. First, many of the bidders had little or no feedback. Based on my experiences on eBay over the years, a new bidder with no feedback is often trouble. So that was a red flag. Second, there is a lot of junk for sale on the site. When I say junk, I mean obviously thrown together re-skins and half built products. I think this potentially keep bidders away as there is just a lot of crap on there both in the apps and sites sections. Finally, I was concerned that because I was a new user I wouldn’t get a lot of bids because I had no feedback record on the site. Fortunately, my concerns didn’t come to light. Instead the sale process was easy, quick and pleasant. Both apps sold quickly, with little fanfare and the transfer process was simple. Payment was automated through Flippa and integrated with Paypal. Their fee was 10% which was perhaps a little high but not unreasonable. Overall I’d definitely use Flippa again as a seller. I also plan to keep an eye on the site to check for any good apps for sale. There are some gems within the cruft available for sale. I am still offering two of my iPhone apps for sale. These are apps I wrote on a whim 4 years ago and have not really done anything with since. Both are monetized with iAd and earn a few dollars a month as is. With some polishing and marketing these could do much better. Surprisingly, there is a decent size market for entertainment apps like these. I have them listed on Flippa or would entertain a sale negotiated directly. Asking price / reserve is $100 each. Price includes the source code and right to sell on the app store. Please contact me for more information. Have you ever been away from home, or traveling on vacation and had a hard time sleeping? If you use a fan or are used to the sounds of nature at home, it can be hard to get to sleep on the road. Relaxing Sounds for Sleep was built to help you fall asleep to the relaxing, calming sounds you are used to. Nature: Many high quality sounds from nature have been recorded and added to the app. These sounds include things like the roaring waves hitting a beach, a noisy forest of bugs and the charming chorus of frogs, among many others. Music: Melodies and musical pieces can be very calming and relaxing. We’ve included a selection of some really great and relaxing music to help you get to sleep. Relaxing Sounds for Sleep will be regularly updated with new sounds and will always be 100% free! Get it today, free, on the App Store! 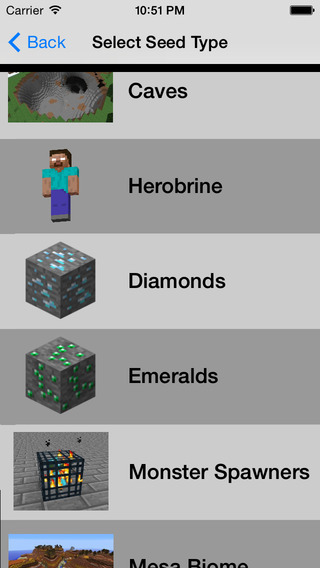 This app features the very best collection of hand picked, tested and reviewed Minecraft Seeds on the App Store! This app features Seeds for Minecraft PC/Mac and Minecraft Pocket Edition. This app will be regularly updated with new seeds and we welcome user contributions. Download the app to find out how to contribute seeds. Jack is nearly a perfect blend of my wife and I. From her, he gets a lot of his looks, wit, personality and his penchant for being a clown. From me, he gets his body shape and size as well as a bit of athleticism and a love of all things computerized. I’ve been teaching Jack a lot about computers since he was young. He’s been able to use a laptop since he was 2. Of course back then he tended to wreck them because he thought popping the keys off my old pc notebooks was great fun. I’ve thought a lot about how Jack views computers and programming compared to how I did as a kid. When I was a kid – by the time I was 8 – I was writing code and building all sorts of things. I had, and still have, an Applesoft BASIC programming guide that I read cover to cover many many times. I used it to build all sorts of neat little programs and games. By the time I was 12 I had dozens of disks with all sorts of programs on them – not only things that I invented myself – but lots of programs I typed in from the magazines of the 80s. Remember COMPUTE magazine? It used to be half code that you could use to type in and create programs or games. I believe its entirely a sign of the times to see how my son looks at computers vs how I did at his age. When I was 11 (in 1987) computers were vastly different. They were quite unreliable and so you had to be good at troubleshooting just to get them to work. In addition programs were harder to come by – you had to phsysically get and copy discs from someone, or find what you need in a store – and hope that when you get it home the discs worked – because they didn’t work quite often. In many cases the programs you wanted or needed just didn’t exist so you had to write it yourself. Today, my son has grown up in an environment where everything just works. Not only that, but if you need an app you just go to an app store and get it. There is no waiting, no copying discs, no shopping around, no tweaking autoexec.bat or config.sys files. It all just works. So in a sense – he doesn’t need to get good at programming and system configuration to do what he wants – at least not in the same way that I did. Where as I had to spend hours building custom boot disks to get my games to work, he just clicks a button and it works every time. So he has been able to focus his computing on more interesting things – what he likes to call “hacking”. Jack “hacks” by adding things to games or finding ways to get items in games. He has “hacked” Club Penguin and MineCraft for the most part. In Minecraft he’s played a lot with mods. This has taught him somethings about system configurations, JARs, ZIPs, application data and some of the other murkier topics of how apps work. Minecraft mods can be surprisingly difficult to get to work sometimes and he has learned a lot about how to get things to work. I’ve learned a lot from Jack as he’s grown up. I have always wanted to teach him about computers. At first I tried to give him the same experiences I had when I was a kid – but he didn’t get into it. It took me a while, but I’ve realized over the years, he’s learning a lot of the same concepts I did as a kid – but in a more relevant way to the way the world works today. He’s learning the skills to use and adapt today’s apps and computers to the desires he has. I think its great, and I look forward to encouraging and watching what he does in the future. I am sure the next 11 years will be just as great! Happy Birthday Jack!